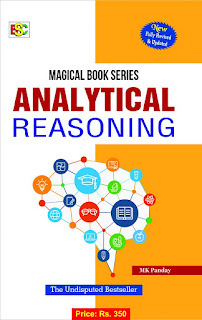 New edition on Analytical Reasoning has been launched by BSC publications, a Delhi based publisher known for banking exam books. The book is now available @ Booksnclicks.com with free shipping in Delhi with Delivery Time 24 Hours, no extra fees in the name of Prime and so on. Buy 2018 edition, fully revised at Rs. 210 (Save Rs.140) 40% off on MRP 350. Reasoning has been made understandable, interesting and easier. The book teaches you how to analyse things properly and score the maximum in exams.